Andrew Revkin from Dot Earth explores whether China will soon switch to natural gas and the answer appears to be, yes. Reports showed that China — which was once considered gas poor — now has estimated volumes greater than those of the United States (which are, as you know, enormous). With the two greatest economies on Earth (U.S., China) embracing natural gas (and Russia supplying Europe with substantial amounts), we appear to be entering a new “gas age”. The gas revolution isn’t all roses. People have legitimate worries about the environmental impacts of fracking—notably on air and water. There are also some worrying signs that fracking operations might emit lots of greenhouse gases—which, if true, would negate much (perhaps all) of the climate change benefits from a shift to gas. My read of that literature is that those fears have been overblown and new estimates based on serious measurement will be more reassuring. Only time will tell how this new ‘gas age’ affects the planet. Living in California means power plants on the beach. It’s a fact of life driving up and down the coast. When you enter Los Angeles driving north there is a line of smokestacks so dense that some refer to it as “the apocalyptic city of the future.” Then as you enter San Diego driving south you pass along the “Betty Boop monument,” two giant domes with a small cap on top, which are the two nuclear generators of San Onofre. They are all facing an uncertain future as California state law requires 33% renewable energy by 2020. Plus, an “upgrade law” which establishes higher standards for air pollution and environmental impact. That second law is the most far-reaching, and somewhat sneaky, because it directly attacks the existing power plants. It forces all the existing plants to pay for expensive upgrades or be decommissioned, and many will be decommissioned. As that happens you can see the future of energy in California start to take shape. 1 out of every 3 plants will be shut down and replaced by renewable energy. Another one-third will be upgraded, and the final third will be a mix. For Southern California that could mean nuclear energy, but it is more likely to be several lower-emission natural gas plants. There is also a hope that renewable energy can take on up to half of the energy needs by 2020, but only time will tell. To hit this point home, my local power plant, just a few miles away, is facing the decommission or upgrade dilemma. According to the owners, AES, the plant is a critical supplier in an ideal location so it won’t be shut down. The plant, a natural gas user, will be upgraded. The plan they have put forward involves a much more modern set-up, including: replacing the industrial smokestack profile with an office building look, using air cooling instead of water (a big win for local ocean groups), much more efficient and powerful generators, quick start capabilities (from 12 hours to 10 minutes), and a reduced emission output. For locals, like me, this is a partial win. We get rid of the ugly smokestacks and get cleaner energy, but still have a local plant giving off emissions and using fossil fuel. So, that image of driving along the California coast may soon change. Maybe those industrial smokestacks will turn into windmills, parks, or knowing how the state works, new million dollar homes. The other day I heard in passing, “wind is now cheaper than coal.” If true, this symbolizes the holy grail of renewable energy. It would mean that a turning point for not only cleaner energy, but global warming, climate change, pollution, foreign oil dependence, and more. To fact check this, I pulled up the top 20 results from Google and narrowed them down to the below articles (most were duplicates pointing at these 5 stories). Not at all definitive but it does give you an idea of the state of the industry. Just keep in mind that the prices may or may not include subsidies or tax breaks, which can drastically change the costs quoted below. The cost of wind power has dropped below the price of coal-fired energy in parts of India for the first time as improved turbine technology (from GE) and rising fossil-fuel prices boost its competitiveness, Greenko Group Plc (GKO) said. The Michigan Public Service Commission (PSC) recently issued a report that finds that electricity generated from renewable energy sources, at an average cost of $91 per megawatt-hour (9.1 cents/kilowatt-hour), is almost one-third cheaper than the cost of electricity from a new coal-fired power plant ($133 per MWh, or 13.3 cents/kWh). Further, the report notes, “The actual cost of renewable energy contracts submitted to the Commission to date shows a downward pricing trend. The cost of buying electricity from a new natural gas power plant…(in 2011) ranged from 7.5 cents per kilowatt hour to 12 cents per kilowatt hour, depending on the length of the contract…The cost of renewable power from wind and solar facilities averaged between 8 and 9 cents per kilowatt hour. It’s not clear here if Google feels this is already won and moving on, or if they have had enough and are quitting. One thing is certain, Google invested nearly a billion dollars ($850 million) in renewable energy last year. This initiative was developed as an effort to drive down the cost of renewable energy, with an RE<C engineering team focused on researching improvements to solar power technology. At this point, other institutions are better positioned than Google to take this research to the next level. So we’ve published our results to help others in the field continue to advance the state of power tower technology, and we’ve closed our efforts. The official position of planet Earth at the moment is that we can’t raise the temperature more than two degrees Celsius. We’re not getting any free lunch from the world’s economies, either. With only a single year’s lull in 2009 at the height of the financial crisis, we’ve continued to pour record amounts of carbon into the atmosphere, year after year. In late May, the International Energy Agency published its latest figures – CO2 emissions last year rose to 31.6 gigatons, up 3.2 percent from the year before. Japanese shut down their fleet of nukes post-Fukushima, so their emissions edged up 2.4 percent. “In the past year, coal plants have been facing a perfect storm of falling natural gas prices, a continued trend of high coal prices and weak demand for electricity,” Susan Tierney wrote in the report. Tierney wrote that those factors have combined to make coal a less desirable fuel source. Coal-generated electricity has been waning over the past few years, dropping to its lowest level on record in March of this year, according to the U.S. Energy Information Administration. At the same time, natural gas-powered plants are becoming increasingly popular as the price of the fuel falls to record prices and few emissions emitted by natural gas. According to Doyle Trading Consultants, the trend is expected to continue as more than 41,000 megawatts from coal-fired power plants could be retired by 2020. If true, the coal-fired fleet would be cut by 17 percent in eight years. Two utilities announced the planned closure of nine coal plants in Illinois, Ohio, Pennsylvania and New Jersey, bringing total retirements (executed and planned) since January 2010 past the 100 mark to 106. A combination of high domestic coal prices, low natural gas prices, new air quality regulations, coordinated activist pressure, and cost-competitive renewables are making coal an increasingly bad choice for many power plant operators. Along with the 106 announced closures, 166 new plants have been defeated since 2002. It’s been two years and time for an update on Bloom Energy. Back in February, 2010, the company made a big splash by announcing their technology and their customers. The technology is revolutionary for the simple fact that it does not use steam-powered turbines. Every power plant in the world from coal to nuclear still uses a steam engine. Think Mark Twain on the Mississippi and you’re not far off. This technology uses a Solid-Oxide fuel cell to convert natural gas into energy without combustion (or steam). For decades, experts have agreed that solid oxide fuel cells (SOFCs) hold the greatest potential of any fuel cell technology. With low cost ceramic materials, and extremely high electrical efficiencies, SOFCs can deliver attractive economics without relying on CHP (steam). But until now, there were significant technical challenges inhibiting the commercialization of this promising new technology. The “low cost ceramic materials” is huge because traditional fuel cells use expensive and rare ones that America fights China for. The other major component here is the “technical challenges” that Bloom has overcome using a term they call “R&D on steroids”. As a venture capital backed company they have been able to rapidly iterate since 2001, resulting in some incredible efficiencies. The first is the fuel cell they launched in 2010 that requires half the natural gas for the same power from traditional sources. The second, recently launched, allows for double the amount of power with the same cell. Put another way, with the same footprint you get 200 kw instead of 100 kw. These innovations have been hugely popular among the right set of customers. Companies like Coca-Cola, Walmart, Google, Bank of America, AT&T, and Ebay have all installed the Bloom Servers at their offices. That success is continuing as seen by the rapid growth in their workforce, which has increased by 70% since 2010, and added 1,000 manufacturing jobs in California. Not to mention establishing an international arm to push this technology worldwide. Back in 2010, when the company was lauded as the next big thing many were skeptical, including myself. Here is my coverage of that press event launching Bloom Energy. At this point, though, it seems clear that the only question is when GE will buy the company or start competing with them. If you drive down PCH in Huntington Beach you will pass the only power plant in Orange County. Located at Newland and PCH, across the street from the beach. The natural gas plant is owned by AES a leading global power company with 132 plants in 32 countries with $17 billion in revenue. It is currently listed at #150 on the Fortune 500 (pdf). 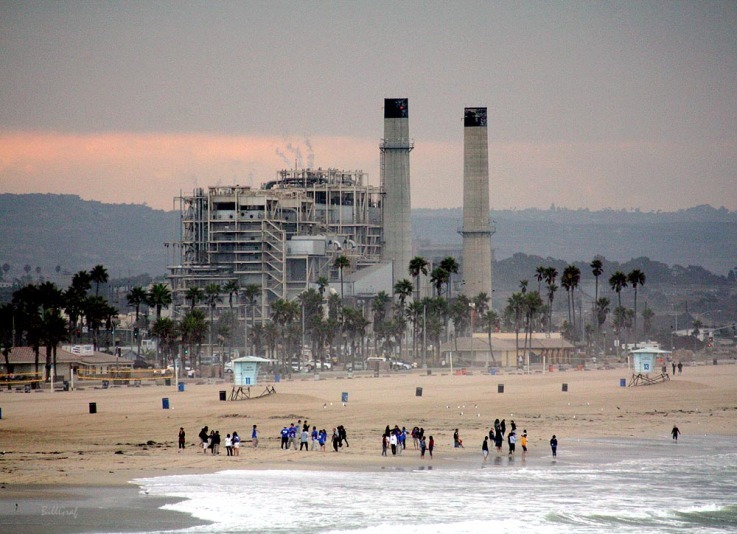 In California, it operates 2 other natural gas plants in Los Alamitos and Redondo Beach. As well as 5 wind stations. Although, the largest section of its portfolio are coal powered plants located elsewhere in the USA. The plant in Huntington Beach was purchased from Southern California Edison in 1998 and has been in operation since 1958. It uses conventional GM steam turbines among others. In 2001, the company petitioned to upgrade and then turn on gas burners 3 and 4 (additional source), which would bring the capacity up to 904 MW. They were successful and, in 2002, the city valued the plant at $325 million.